Handcuff SAM — Key Systems, Inc. The GFMS™ Handcuff Control Device manages local and distributed access to handcuffs using high-security, electronically-controlled metal retaining arms. Locked securely into place, handcuffs are only released to authorized users with active PINs. Each position is individually numbered, and can be assigned to one or more users. 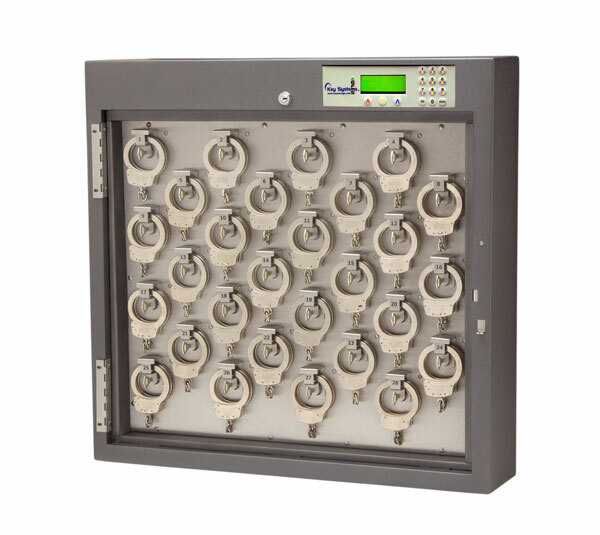 As with all Key Systems, Inc. GFMS ™solutions, the Handcuff Control Device features fully-encrypted browser-based technology, enabling remote control, monitoring, and programming of each cabinet through a local area network, or over the World Wide Web. For more corrections industry solutions beyond handcuff control, please read the following literature to gain information on other great prison security products and solutions provided by Key Systems, Inc. Custom SAM engineered to house handcuffs and over-sized keys.